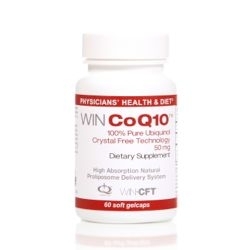 WIN CoQ10™ is a nutritional supplement containing ubiquinol, the reduced form of coenzyme Q10, which has been shown to help maintain healthy blood pressure levels, promote heart health and maintain healthy neurological function. WIN CoQ10 also uses WIN-CFT™, a patent-pending crystal free technology which improves dissolution and absorption of CoQ10 within the body. Maintaining coenzyme Q10 levels are essential as coenzyme Q10 is a critical component of energy metabolism at the cellular level. To help extend CoQ10’s energy production benefits, this supplement contains a versatile antioxidant called alpha lipoic acid (ALA). This product is gluten free. OTHER INGREDIENTS: Softgel Capsule (gelatin, glycerin, water, natural caramel color), d-Limonene, Caprylic Acid, Capric Acid and Alpha Lipoic Acid. Contains NO soy, milk, egg, crustacean shellfish (lobster, crab, shrimp), wheat, yeast, gluten or corn. Contains NO sugar and NO artificial sweeteners, flavors or preservatives. SUGGESTED USE: Take 2 capsules per day with a meal. Some people may realize additional benefits with a higher dosage.